TOKYO (Reuters) - Japan Post Holdings and its two financial units burst out of the gate with gains of 16 to 33 percent on debut on Wednesday, after the government raised $12 billion (7.78 billion pounds) from the triple IPO in Japan's biggest privatisation since 1987. The listing of the national postal and savings giant is a key step in Prime Minister Shinzo Abe's ambitions to kick-start Japan's sluggish economy by encouraging risk-averse households to invest or spend more of their low-yielding bank deposits. "It is significant that this IPO has brought in funds from individual investors and gave them some profits," Monex Securities chief strategist Takashi Hiroki said. "There are many people out there who bought shares for the first time in their life in this IPO... If even some of these people who made profits in Japan Post shares buy other shares, that would be a big step." As of 0525 GMT, group parent company Japan Post Holdings Co was traded at 1,665 yen ($13.76), 19 percent higher than the initial public offering price of 1,400 yen. Japan Post Bank Co shares were at 1,670 yen, up 15 percent from an IPO price of 1,450 yen and Japan Post Insurance Co was at 3,410 yen, 55 percent above its 2,200 yen IPO price. The government allocated about three quarters of the total offer to Japanese individual investors. The solid performance helped to boost the entire Japanese market, with the Nikkei average rising 2.2 percent, although analysts said the shares were priced cheaply so a strong debut was expected. "The pricing seems as if the government recognises that Japan Post's growth prospects are limited in the near future. We need more time to see their growth potential," Rakuten Securities senior market analyst Masayuki Doshida said. Japan Post firms, which now have a combined market value of more than 16 trillion yen ($132.17 billion), have by far the most extensive retail network through 24,000 post offices around the country. Still, with postal delivery services declining due to the rise of electronic communications, the future of the Japan Post firms could depend on the success of the two financial subsidiaries, Japan Post Bank and Japan Post Insurance. Japan Post Bank President Masatsugu Nagato, in an interview before Wednesday's market debut, said his bank would look at increasing investment in assets such as emerging market and high-yield bonds to boost returns. In the past, Japan Post invested a large part of its funds in government bonds and safe but low-yielding assets. Keenly aware of a lack of a strong growth scenario, especially for its core postal business, Japan Post Holdings President Taizo Nishimuro said the company aims to transform itself into a global logistics powerhouse. "We need to be globalised, otherwise we cannot survive in the world's logistics industry. We will of course make the best use of Toll Holdings' potential but we don't have much time," he told a news conference at the Tokyo Stock Exchange on Wednesday. "We must also pursue other means," he said, indicating the possibility of more acquisitions on top of its A$6.5 billion ($4.7 billion) purchase of Australian freight and logistics firm Toll earlier this year. The government eventually aims to raise about 4 trillion yen through additional stake sales over the next several years to fund the reconstruction of areas hit by the 2011 earthquake and tsunami. 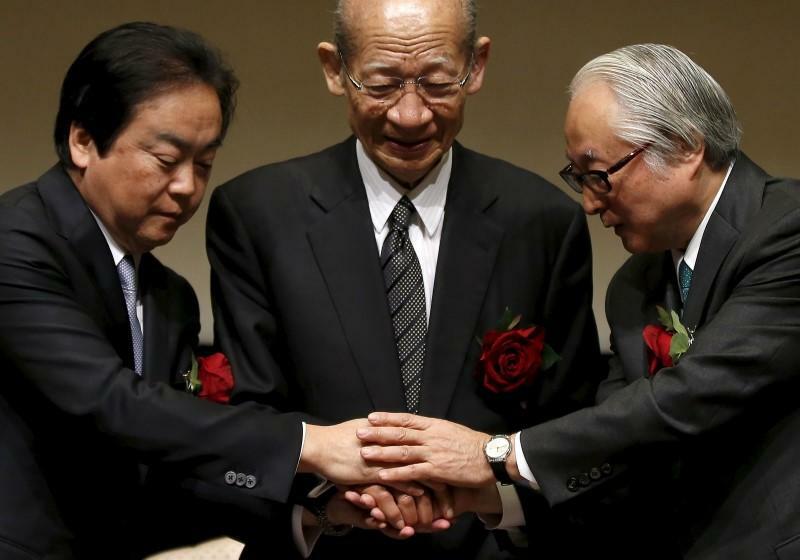 About 10 percent of each Japan Post company's shares were sold to the public, raising about 1.4 trillion yen, in the largest privatisation of a Japanese state-owned firm since that of Nippon Telegraph and Telephone Corp in 1987.